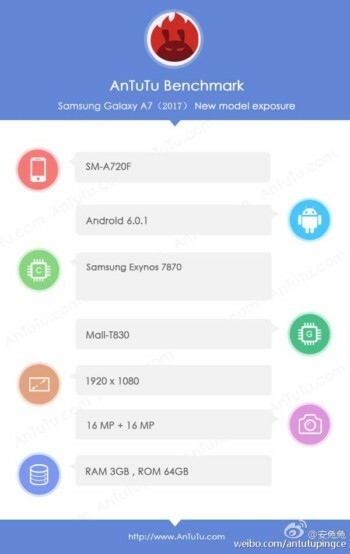 After GFXBench and India's import/export tracking website Zauba, the Samsung Galaxy A7 (2017) has now been spotted on AnTuTu benchmarking website. The listing reveals that the device is powered by an Exynos 7870 chipset, and has 64GB storage. Other specifications revealed by AnTuTu, including full HD display, 3GB RAM, and 16MP/16MP camera combo are inline with what the phone's GFXBench listing had revealed. The handset is rumored to sport either a 5.5-inch or a 5.7-inch display.